Due to the rise of online resources, and rapidly-evolving attitudes surrounding marijuana, the average user has better access to information about the plant than ever before. But even seasoned consumers might not have a crystal-clear understanding of terms like indica and sativa: nor are the effects of each subspecies universal, or black-and-white. Here's a quick primer for those who've always wanted to know the difference, but were afraid to ask. Hailing from countries like Columbia, Mexico, and Thailand, sativas are loosely-branched, lighter green in color, and get super tall compared to indicas - around 6 feet on average, but potentially as high as 20 feet. 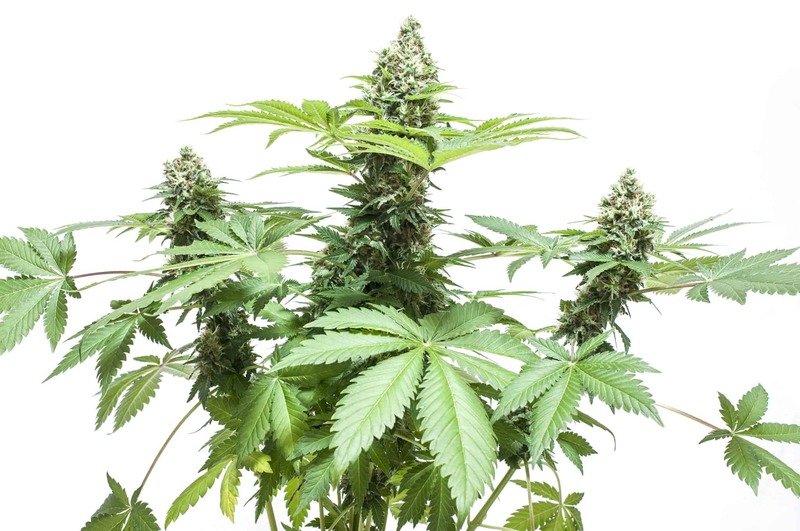 With long, narrow leaves, less-obedient growth habits, and longer budding times than indicas, sativas present more of a challenge for indoor growers: according to writer/grower Erik Biksa, "Sativa-dominant strains tend to tolerate warmer temperatures and higher humidity levels versus indica strains during budding, making them a suitable choice for growing indoors during summer months." Sativas need between 9-12 weeks before they're ready for harvest. Sativas have a higher concentration of THC and lower CBD than indicas: many users prize sativa-dominant strains for their energetic, coffee-like buzz accompanied by feeling of well-being and ease. Sativas can help boost creativity and imagination without promoting the heavy, sedated feeling stereotypically associated with a strong marijuana high. Originating in the cooler, higher-altitude climates of Afghanistan and Pakistan, indica plants tend to run considerably shorter than sativas, averaging between 2 and 4 feet: their signature, thick coating of resin developed as protection against harsher weather conditions. The plants tend to be a darker shade of green, more densely branched, and have wider leaves than sativas. The compact size, higher yield, and 6-8 week flowering time makes indicas a favorite among indoor growers. Indicas have a chill, sedative effect that's ideal for users who want to relax, fall asleep more easily, treat migraines and other forms of pain, or reduce nausea. Ross' Gold founder and CEO Ross Rebagliati tells Civilized this interesting tidbit: "Since indicas produce more per plant, back in the day, for the most part, people would be getting indicas from their local drug dealer, which would literally keep people on the couch." He blames, in part, the historical predominance of indicas in North America for creating the familiar, lazy-stoner stereotype. Now, however, "there are options," says Rebagliati. "You can go to dispensaries and you can see what is recommended for morning, noon and night." As the name suggests, hybrid strains combine characteristics of both indica and sativa: according to High Times, as many as "95 percent of cannabis strains today are hybrids with only a handful of landrace strains qualifying as pure sativa, indica or ruderalis." We have hybrids to thank for both the unprecedented strength, and mind-boggling diversity of modern marijuana: because they can express such a wide variety of characteristics, a knowledgeable budtender or a strain-finding tool like Leafly is an invaluable resource when it comes to determining the effects of individual hybrid strains. Remember, as well, that none of these categories are exact: depending on the consumption method, your individual temperament, and innumerable other factors, indicas don't always produce a chilled body-stone, and sativas aren't universally uplifting and cerebral. Expectations, too, play a role - if you're told you're going to feel a certain way, you're more likely, perhaps, to have that experience. As for what works best for you - as always, trial and error informed by solid research is your best guide.